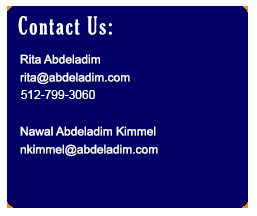 Abdeladim & Associates is pleased to be selected as a provider of "DIR Contract No.DIR-SDD-1983" to all DIR Customers, including Texas State and Local Governments, Texas School Districts and Institutions of Higher Education. Application Maintenance and Support includes the skills and requirements for supporting application systems, including troubleshooting, modifying, maintaining and enhancing legacy systems. Application Maintenance and support also applies to applications running in a production environment. Project Management service providers may perform any or all of the processes recognized by the Project Management Institute as published in Table 3-45 of the most recent edition of the PMBOK® Guide, Third Edition or most recent. Effective project management can be conducted by using off-the shelf tools, utilizing the customer's tools and processes or by using the vendor's own proprietary tools and processes to manage a particular project. Technology Upgrade/Migration may be required to increase business functionality, reengineer a busines function, keep current with vendor upgrades or when upgrading existing technology. Technology Transformation may be accomplished by converting/migrating legacy applications to a new technology either with or without new business functionality or it may include introducing new technology into the enterprise. Technology Upgrade/Migration may also include providing website content accessibility compliance. For more information regarding these services and this easy to use and flexible procurement vehicle, see the DIR Cooperative Contracts Program.